Founded by a principal and a former teacher, LearnZillion is the first open, cloud-based curriculum dedicated to championing teachers and creating powerful student learning experiences. 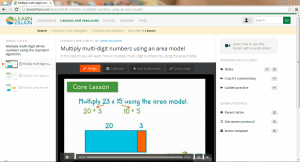 LearnZillion equips educators with a powerful learning platform, including expertly-crafted Math and ELA lessons for grades K-12 that can be easily distributed to students. Create classes by importing your class rosters and have students log-in using their individual class code. Choose a content area (Math or ELA) and a grade level. Choose a unit and assign a lesson to your students. Submit a copy of your student responses.